Reliable, powerful and efficient, 140 GPH Fountain Pump. Suitable for fountains and water features requiring up to 31 inches of water lift. Maximum Pumping Height: 40 inches. Algreen's whimsical spitters add sparkling streams of water and tranquil sound to your pond and water garden. Each resin spitter is painted with a beautiful patina finish. Includes submersible pump with adjustable flow rate, suction base and 6' cord. Contemporary design and modern style makes the Montgomery fountain a great conversation piece. Functional art for the yard. Easy to assemble, comes complete with everything you need, including an energy efficient pump and LED lights. Constructed from NuCrete., a durable fibre reinforced concrete. Capture a sense of peace and serenity with the Kalura fountain. Easy to setup and maintain, comes complete with everything you need, including an energy efficient pump. Made from 4th generation NuCrete, a fibre reinforced concrete material that provides the strength, appearance and durability of traditional concrete products, without the weight. Standing at 45-inches, this elegant 3-tiered Malibu fountain makes a grand statement in any setting. Copper spill points create a soothing spill effect. Easy to assemble, comes complete with everything you need, including an energy efficient pump and PumpJacket pump filter. Made from 4th generation NuCrete, a fibre reinforced concrete material that provides the strength, appearance and durability of traditional concrete products, without the weight. 530 LPH Fountain Pump with 10 ft. Cord Reliable, powerful and efficient, 140 GPH Fountain Pump. Suitable for fountains and water features requiring up to 31 inches of water lift. Maximum Pumping Height: 40 inches. 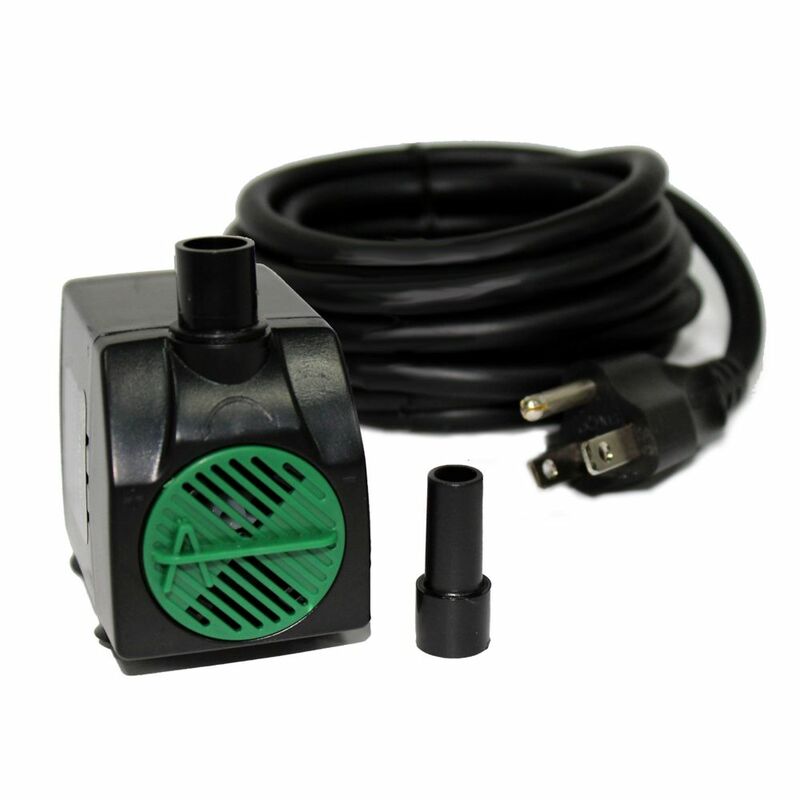 530 LPH Fountain Pump with 10 ft. Cord is rated 3.0 out of 5 by 2. Rated 1 out of 5 by Cleo B from Very disappointing I bought this pump to replace the original one that came with the fountain....which was at least 20 years old. It was a 120GPH and lifted the water about 12 inches. This pump didn't even last two months. Bought it July 18 and it died August 8. Very disappointed. Angelo D&eacute;cor Model # AD40140 | Store SKU # 1000724805 what is the &nbsp;dimensions? The actual dimensions of the pump body itself are approximately 2.4 x 1.8 x 2.3 inches. Angelo D&eacute;cor Model # AD40140 | my question is actual dimentions of this pump please. Must be like 3&quot;x3&quot;x3&quot;?? ?